Feel free to use it. 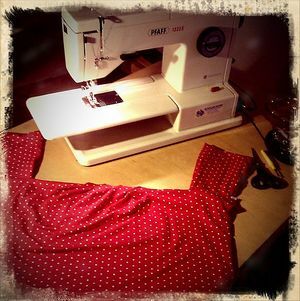 If you want instructions, ask someone who has experience with sewing machines. There is a manual below. I would like to have repairs or check-ups done by a professional. Please notify the owner when something is broken. If the machine needs oil you can do that yourself (or ask Narya). Last service check: 6 November 2013. This sewing machine can be used for light fabric and for relatively heavy fabric, such as denim, thin (fake) leather, and coat fabric. It is not suitable for very heavy fabric. Needles and feet are in the case. Bring your own thread. This page was last edited on 12 April 2017, at 18:48.